Sclerotherapy is an injectable treatment that reduces the appearance of spider veins and smaller varicose veins. Sclerotherapy involves injecting a solution directly into unwanted spider or varicose veins. We use Asclera, a solution which causes less stinging at the injection site than other options. Once injected, Asclera damages the unwanted veins, causing blood to reroute through healthier vessels. The injected veins then collapse, are reabsorbed into the body and fade away, typically within six weeks. Before | After: Sclerotherapy is especially effective for treatment of small, dark “spider veins” on the legs and ankles. 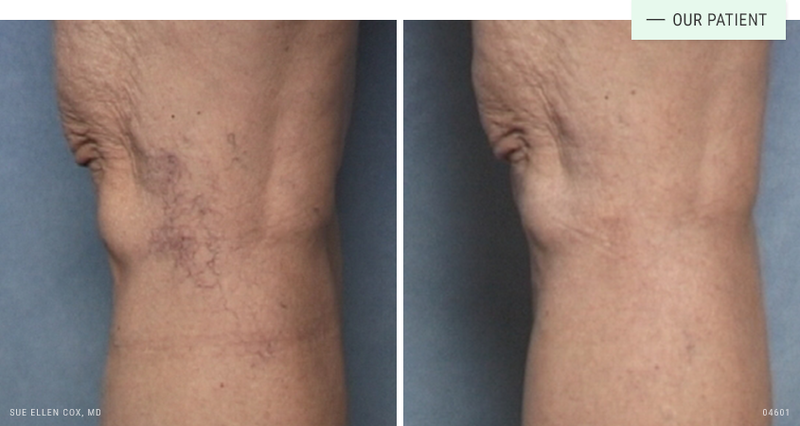 Before | After: Sclerotherapy is effective for all ages. The FDA has approved Asclera to safely treat spider veins and small varicose veins. It has an excellent safety profile. Like any surgical or non-surgical procedure, there are risks. Dr. Cox stresses the importance of finding an physician experienced in this procedure. Sclerotherapy treatment is very well tolerated. We suggest that patients come dressed in loose clothing, or wear shorts we provide for the treatment. A very small needle is used to inject a solution directly into the veins. Slight stinging or discomfort is possible during the injections. The length of the procedure depends on the number of veins you would like treated, but typically ranges from 15 to 30 minutes. There is a limit to how much solution can be injected at any one visit. There is no true down time associated with sclerotherapy treatment. Mild itching, tingling and burning are normal side effects which subside within minutes of treatment. You will be asked to wear support stockings for approximately two weeks following treatment to maintain vein compression and maximize results. The treated veins may appear darker before subsiding. This is a temporary and normal part of the healing process. Sclerotherapy is clinically proven to reduce the appearance of spider veins and smaller varicose veins. 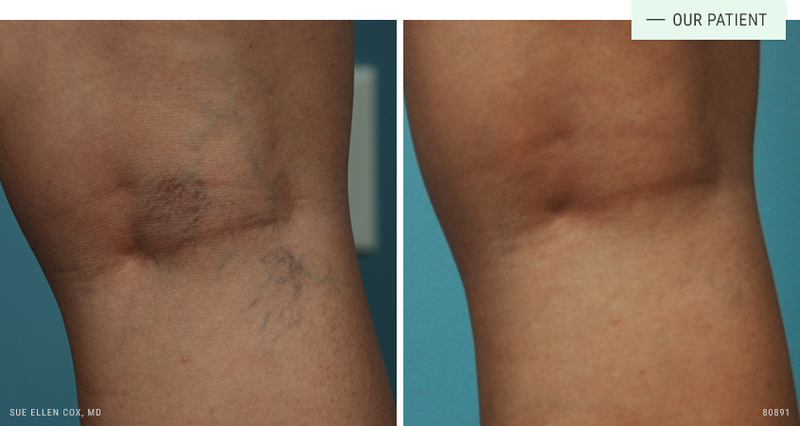 Veins typically begin to fade three weeks after treatment, with full effect visible about six weeks post treatment. In addition to the cosmetic benefit, sclerotherapy also may improve aching, swelling, burning and cramping sometimes associated with varicose and spider veins. A series of treatments is required to produce results. Dr. Cox is the only provider of injectable treatment in our office. An internationally recognized expert of these treatments, Dr. Cox believes they should be performed by a physician with an intimate understanding of facial anatomy, product selection and safety measures. I've been seeing Dr. Cox on/off for 18 years! It started with Laser Resurfacing that took 10 years off my face, years later I went back for some injections and leg vein work! Dr. Cox is an amazing Doctor that really cares about her clients! I am now doing a Clinical Study with her and I'm so excited! A doctor you can trust!